(Nanowerk News) Graphene’s great strength appears to be determined by how well it stretches before it breaks, according to Rice University scientists who tested the material’s properties by peppering it with microbullets. The two-dimensional carbon honeycomb discovered a decade ago is thought to be much stronger than steel. But the Rice lab of materials scientist Edwin “Ned” Thomas didn’t need even close to a pound of graphene to prove the material is on average 10 times better than steel at dissipating kinetic energy. The researchers report in the latest edition of Science ("Dynamic mechanical behavior of multilayer graphene via supersonic projectile penetration") that firing microscopic projectiles at multilayer sheets of graphene allowed the scientists to determine just how hard it is to penetrate at the nano level – and how strong graphene could be in macroscopic applications. Thomas suggested the technique he and his research group developed could help measure the strength of a wide range of materials. While other labs have looked extensively at graphene’s electronic properties and tensile strength, nobody had taken comprehensive measurements of its ability to absorb an impact, Thomas said. His lab found graphene’s ability to simultaneously be stiff, strong and elastic gives it extraordinary potential for use as body armor or for shielding spacecraft. The lab pioneered its laser-induced projectile impact test (LIPIT), which uses the energy from a laser to drive microbullets away from the opposite side of an absorbing gold surface at great speed. In 2012, they first used an earlier version of LIPIT to determine the properties of multiblock copolymers that could not only stop microbullets but also completely encase them. Since that study, Thomas and lead author Jae-Hwang Lee, a former research scientist at Rice and now an assistant professor at the University of Massachusetts at Amherst, have enhanced their technique to fire single microscopic spheres with great precision at speeds approaching 3 kilometers per second, much faster than a speeding bullet from an AK-47. The researchers built a custom stage to line up multilayer graphene sheets mechanically drawn from bulk graphite. They tested sheets ranging from 10 to 100 nanometers thick (up to 300 graphene layers). They then used a high-speed camera to capture images of the projectiles before and after hits to judge their speed and viewed microscope images of the damage to the sheets. In every case, the 3.7-micron spheres punctured the graphene. 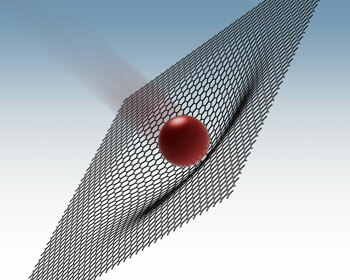 But rather than a neat hole, the spheres left a fractured pattern of “petals” around the point of impact, indicating the graphene stretched before breaking. The experiments revealed graphene to be a stretchy membrane that, in about 3 nanoseconds before puncture, distributes the stress of the bullet over a wide area defined by a shallow cone centered at the point of impact. Tensile stress cannot travel faster than the speed of sound in materials, and in graphene, it’s much faster than the speed of sound in air (1,125 feet per second). “For graphene, we calculated the speed at 22.2 kilometers per second, which is higher than any other known material,” Thomas said. As a microbullet impacts the graphene, the diameter of the cone it creates – determined by later examination of the petals – provides a way to measure how much energy the graphene absorbs before breaking. Controlled layering of graphene sheets could lead to lightweight, energy-absorbing materials. “Ideally you would have a lot of independent layers that aren’t too far apart or so close that they’re touching, because the loading goes from tensile to compressive,” Thomas said. That, he said, would defeat the purpose of spreading the strain away from the point of impact.